In Gadgetbox's recent story on the latest Sony compact camera introductions, a Sony executive was quoted as saying: "'true decline' has set in for digital cameras, in which sales are down 20 percent, the first time losses have hit in the double digits. The exodus is most pronounced amongst entry level users, who have turned to their phones as their all-in-one must-have gadget." Okay. Then let me ask this: why were all the mirrorless camera makers working so hard to target entry level users? At this point we've got the E-PM1, the GF3, the J1, and the C3—all of which clearly target the entry user—yet you could also say that the E-PL models, the GF2, the V1, and even the 5N all target the less sophisticated user. Did Nikon, Olympus, Panasonic, and Sony all miss the prediction of loss of the entry user to camera phones? I suspect that the reason why we have so many entry-level mirrorless cameras is that the camera companies think that they can migrate the former compact camera entry-level user to become an entry-level mirrorless user. You know, as in "well, if they won't buy a Sony HX9V maybe they'll buy a NEX-C3." Oh, you noticed how hollow that rings, too? Another interpretation of that might be (tongue inserted in cheek) "here's something more sophisticated, flexible, and complex, but it's entry-level and comes in colors, so you'll like it." As I've noted several times on both my sites, the trends in camera sales are following a predictable pattern, one that's almost exactly repeated from the film days (disposal cameras were the camera phone of the film era). The question for the next five years is exactly the question that was being asked near the end of the last century: what will dramatically spark sales growth in the camera market? Those of you who read my bythom.com site regularly already know my answer: CPM. As in Communicating, Programmable, and Modular cameras. 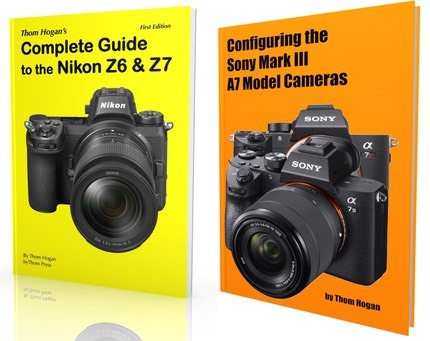 My defining article on redefining cameras appeared in Spring 2010, but I had been hinting at and sneak peaking a lot of my thinking for years. I think it takes a fundamental shift in thinking about photography, and thus the camera, for there to be another big growth spurt in digital cameras. Some of you are saying "but wait, what about the upcoming offerings from Fujifilm and Olympus (and the existing NEX-7)?" Those are all high-end offerings targeted at much more sophisticated users, after all. Well, I'm certainly not going to kick them out of the hot tub, as those cameras are ones that strongly appeal to shooters like me, but a high-end camera is not the answer to sparking the camera industry to a whole new growth spurt. High-end is a relatively small subset of the market, though those users do buy/upgrade frequently, distorting its importance a bit. High-end mirrorless will be a nice profit center for the companies that do it right, but the sweet spot in interchangeable cameras has always been US$500-1000, with much more buying at the lower end of that range than the high. Exactly where we're getting entry level mirrorless cameras. Give the user more control over the interface and the workflow. Make the bits move freely from camera to wherever the user wants them. Don't keep forcing us to buy the same Mode dials and lens mounts and hot shoes and LCD displays over and over again; let us upgrade only that which needs upgrading. Communicating, programmable, modular. When I write these articles on trends, one of the comebacks I usually get is "yeah, but they make their money on lenses and accessories." Well, yes, camera companies do make money on those things. Unfortunately, they sell approximately only 1.5 lenses for every camera body. That's right, a huge percentage of mirrorless and DSLR users never buy a second lens. Huge. Moving a high-end compact user to a low-end mirrorless camera will net a camera company exactly a half lens more sales per camera. So basically we quickly get right back to "they need to sell more cameras." A big part of the camera companies' problem is also marketing, not product. Which camera company has yet to say this directly to those entry-level users "Remember all those times when the camera wouldn't shoot fast enough plus all those out of focus images you got? Hey, we fixed that, but you have to buy a different kind of camera." Nikon could certainly say that to Coolpix users. Of course, they'd risk tanking Coolpix sales in doing so. And there's the rub. One of the problems is that all the camera companies are trying to keep their existing businesses on life support while they try to figure out what you'd really buy. Olympus doesn't want to say 4/3 is dead and the future is m4/3. Sony and Nikon both want to protect their compact camera and DSLR sales. Canon is last to the mirrorless market because they thought they'd sell Powershots and DSLRs forever (still do: they're predicting they'll sell 18% more compacts and 28% more DSLRs in 2012 than 2011; of course, "sell" in that context means manufacture and ship to subsidiaries, not sell to users). In Silicon Valley almost everyone believes one thing about products: if someone is going to cannibalize your sales, it ought to be yourself. Put another way: do unto yourself before others undo you. If you don't recognize that construct, it's Darwinism in action: survival of the fittest. So let me challenge the mirrorless companies: is that your best shot? Are you going to continue the easy way of "more megapixels, more Art Filters, more iteration, better video frame rates"? Or will you finally be willing to think about the user for a minute, and why they prefer using their camera phone instead of your cameras? Because that's the only way you're going to realize that you have to cannibalize your existing cameras to create the next wave of camera demand.